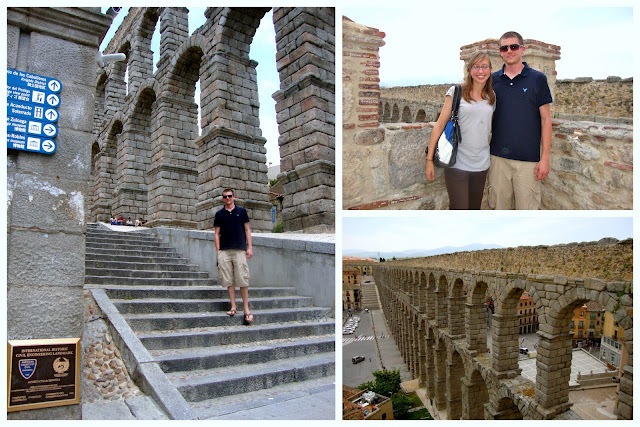 Taking advantage of the fact that I don't work on Fridays, Chad and I took a day trip to Segovia yesterday. 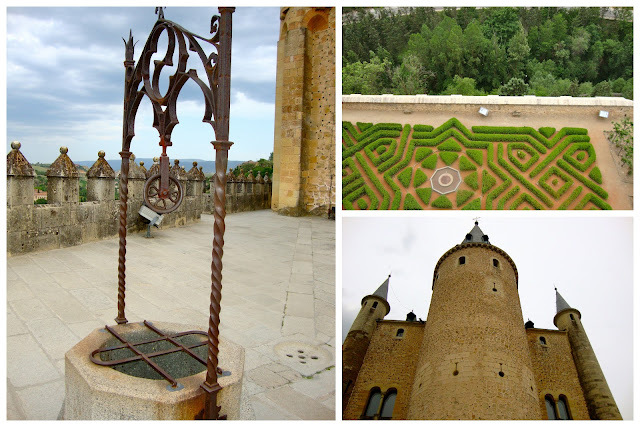 With a population of 55,330, Segovia lies a little over an hour northwest of Madrid. 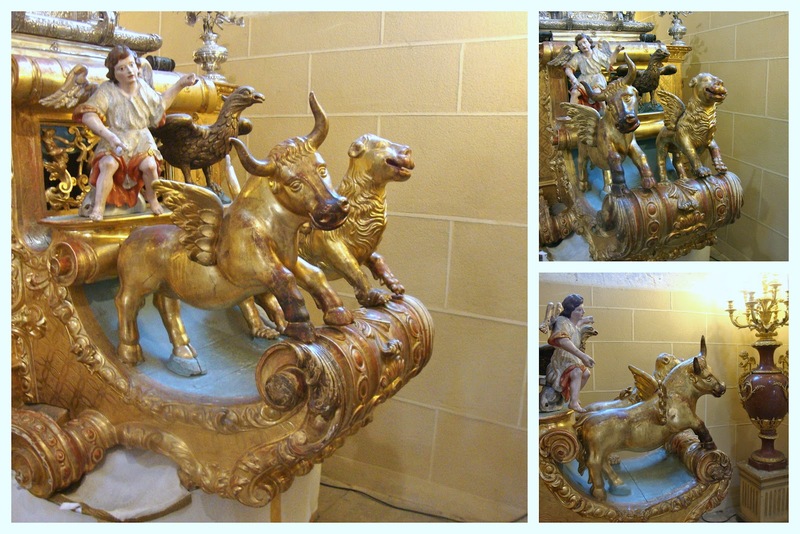 I had been to Segovia once before, at the very start of my study abroad year in the fall of 2009. 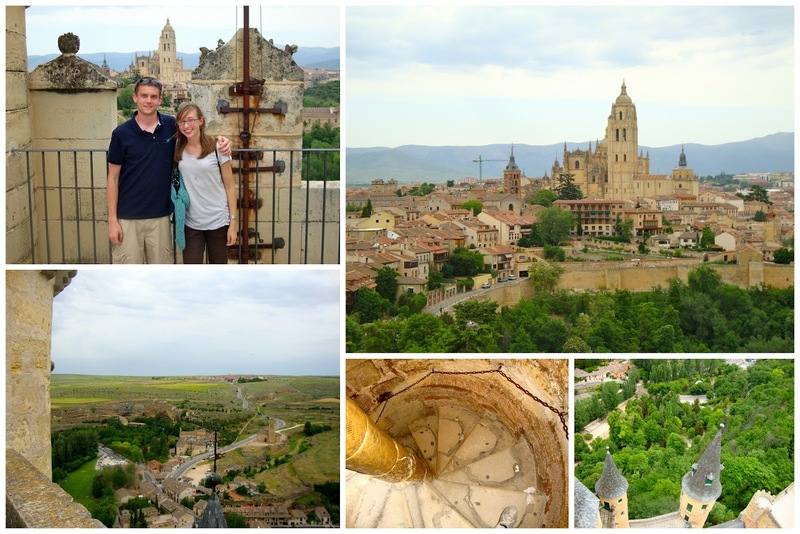 There are three must-sees in Segovia: the aqueduct, the cathedral, and the alcazar. We took a bus from the Príncipe Pío bus station. If you want to take the bus to Segovia, look for the "Grupo Sepulvedana" booth on the blue level of the bus station. You can buy tickets right there, and the bus leaves from doors 7 and 8 on the same level. Upon arrival in Segovia, we stopped at a little café/pastelería where Chad had his first Spanish café con leche (coffee with milk). On the walk to Segovia's aqueduct we ran across the Iglesia de San Millán, which captured my eyes. We then arrived at Segovia's famous Roman aqueduct. The Aqueduct of Segovia was made between the 1st and 2nd Centuries AD. The Roman aqueduct was built with absolutely no mortar; just stones stacked on stones. Chad and I were both excited to see a plaque nearby the aqueduct naming it an International Historic Civil Engineering Landmark by ASCE (Chad just graduated from UW-Madison with a Civil Engineering degree, and I've got civil engineers in my family). A photo was necessary. 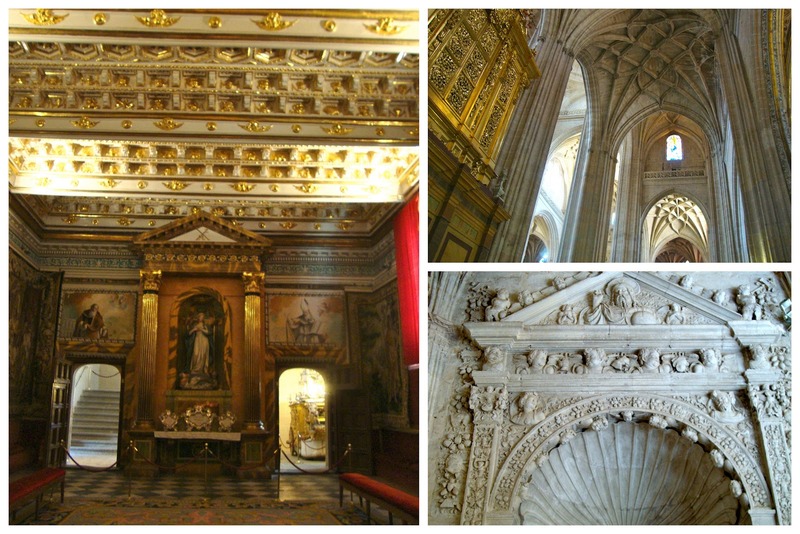 On the way to the cathedral, we walked past the Casa de los Picos. Segovia's gothic cathedral is one of my favorites in Spain, from the outside. We paid to go inside, which I'm glad we did. As I recall, mass was in session when I visited three years ago, so I never got to go in. After our cathedral visit, we wandered around looking for a place to have lunch. I wanted us to get a menú del día somewhere, but out of the touristy-zone. 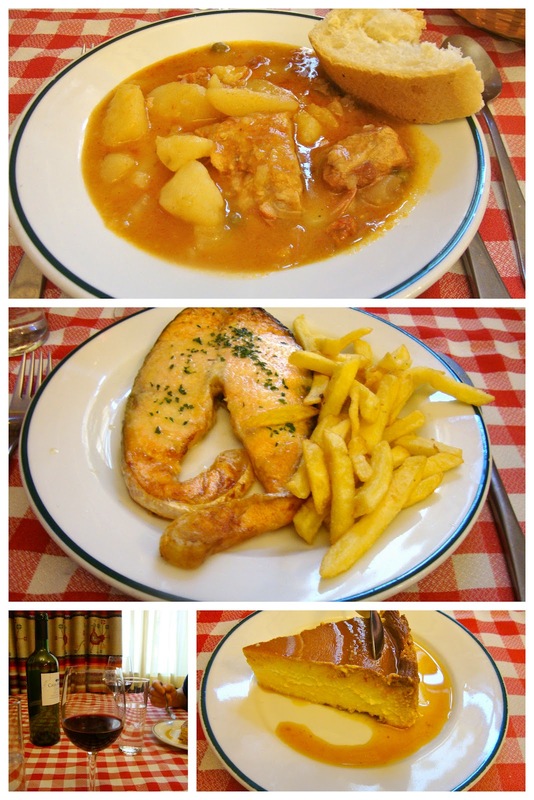 The specialty food in Segovia is cochinillo (suckling pig), which Chad told me he wanted to eat for lunch. I think we ended up at the perfect spot. The restaurant wasn't very busy, and there were only locals inside. The walls were decorated with bull fighting posters and pictures of the owner with bullfighters that have eaten there. The salmon in my second course was absolutely delicious. Chad got the special menú of the day which consisted of sopa castellana, cochinillo, and a dessert (he picked cheesecake). A bottle of wine was included in our menus. After lunch we walked to the alcázar, the historic fortress/castle that was supposedly Walt Disney's inspiration for the castle in Sleeping Beauty. Chad liked touching everything inside, despite the numerous "no tocar" signs. We also got tickets to climb the torre (tower) to the top of the alcázar, which has a great view of Segovia. You may be out of breath by the time you reach the top, but it's worth it. After leaving the alcázar we made our way back to the bus station, stopping at that same pastelería for some ice cream and another café con leche. We caught the 8pm bus back to Madrid and arrived at Príncipe Pio around 9.30pm. We met up with some of my friends and went to a nearby bar where Chad learned what a jarra is. When the bar closed, we headed down to the river to keep the night going. Chad and I took the night buses home (metro closes at 1.30am) and got back to my place around 3am, which isn't too late here. That morning I had been woken up by a call from Chad's airline, asking me if I would be home between 11am-2pm for them to deliver his luggage. I told them that I wouldn't, but a roommate would. And sure enough, when we got back home that night, his luggage was sitting in my room.